Today's recipe comes from Juanita's Cocina, who is a fellow member of The Secret Recipe Club. Juanita (whose real name is Jen...but you have to go read about her on her blog to figure that one out!) is a lover of all things food and loves to experiment in the kitchen. At first I made her Brown Butter Chocolate Chip Oatmeal Cookies, which were absolutely delicious, but I decided not to feature them today. They'll be on the blog soon, though, so be sure to check back! Instead, I made this mouth-watering, easy peasy beef dish. Pure bliss. I've seen pictures of this Korean Beef all over Pinterest, so I was stoked when I saw it on Juanita's recipe list. I knew I wanted to make it soon, and this was the perfect excuse to do so! And it definitely lived up to my expectations. It was easy to make since it uses ground beef, so there's no trimming or slicing involved. The sauce blends the perfect amount of sweetness and savoriness together, and the pepper flakes and ginger balance it all out. This is a perfect weeknight meal that can be made in less than 20 minutes. Enjoy! Heat a large skillet with the sesame oil over medium heat. Once the skillet is heated, brown the hamburger and minced garlic until meat is cooked through. Drain all fat from the meat. In a small bowl, combine the soy sauce, brown sugar, ginger, salt and pepper, and red pepper flakes. Pour mixture into the skillet over the meat and bring to a simmer. Simmer the meat in the sauce for 5 minutes, or until the sauce thickens and reduces. 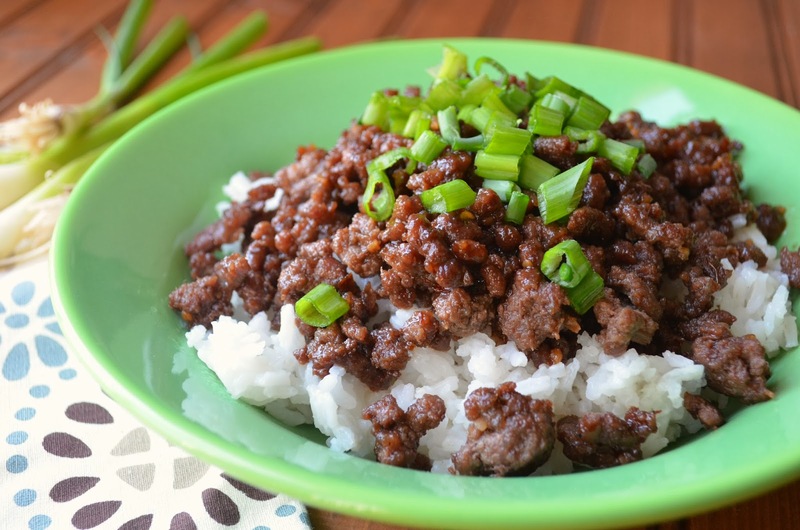 Serve the Korean beef over rice and top with a small handful of green onions. We love Korean. We will have to try this - it sounds fabulous! This looks so delicious! A perfect weeknight recipe! 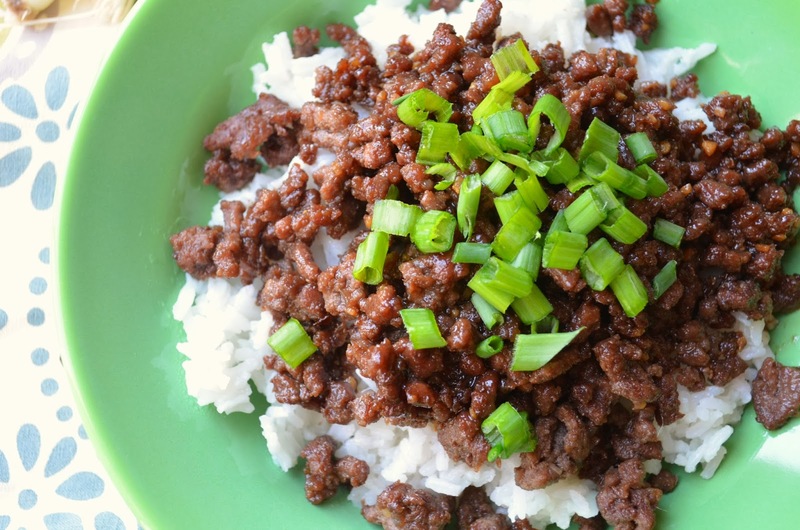 Love the Asian flavors in this dish - I'm going try it with ground turkey. Okay. I don't often jump up and make something when I see it on a blog but I had all these ingredients on hand and needed something quick for dinner tonight. I LOVED this and it's a keeper. Thank you so much for sharing! 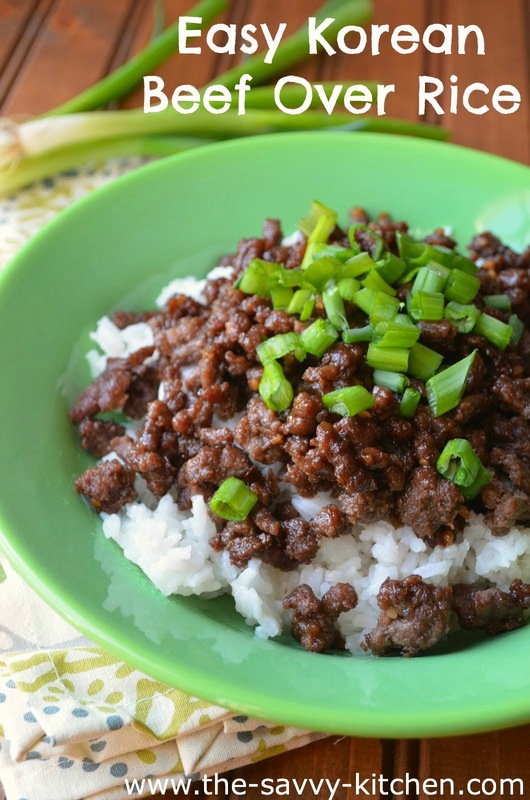 I love Jen's recipes....and this Korean beef looks like a winner! OH! Yes, PLEASE!! This looks like a perfect quick dish with lots of flavor.